Happy new years friends! Another year behind us and another thrilling year on the horizon. From the looks of facebook and holiday cards, looks like all of you think 2013 is “THE YEAR,” …I’m right there with you! I’m a big list maker. I make daily lists, sometimes hourly lists, I thrive when I can cross things off my lists. I make lists for today, lists for the weekend and lists for the year. I’m not one to call them “resolutions” per say, but rather intentions or goals for where I see my visions headed. This year is like no other. I am still working on my “2013 best year ever” list but I will tell you how I break it down. – pinch myself everyday that I am so lucky to be doing what I love surrounded with amazing people who I admire & respect! – bimonthly posts focused more on family outings & events (think “i heart cleveland families”) written by one of my besties who happens to rock at having three kids & being a super friend to all. – Integrating additional guest posts from the MEN of the CLE. While I try to keep the blog gender neutral, come on people we all know I tend to drift towards glitter and bubbles…it’s time to hear what the guys like…interested men drop me a note! – lastly to do a better job at twitter and corresponding with the readers. So that’s a little look at my intentions/goals for this exciting year upon us. I can’t wait to see how the year pans out. I’m lucky to have such a great group of readers, friends and family to kick off 2013 with. Cheers and love to you all! More and more I’ve been noticing the love and passion that area Northeast Ohio lovers have dedicated to their skin. In Ohio “all things are possible,” from license plates to tattoo art–when it comes to making an outward statement for the love of our great state. This past Friday, at the AMAZING PechaKucha Night I had the privilege of meeting Katie. 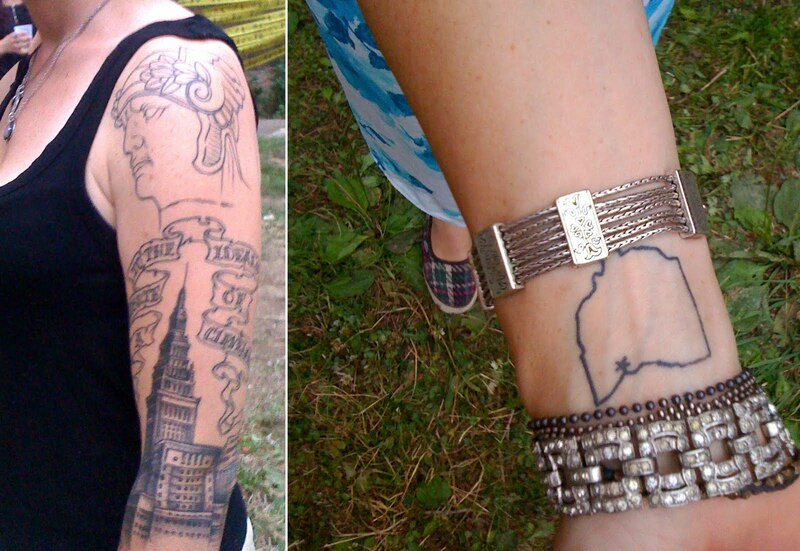 Native to Avon Lake Katie moved away from Cleveland for a brief stint, but is back and has the tattoos to prove it. Her arm proudly displays the Terminal Tower and one of the Detroit Superior Bridge Statues, her wrist complete with the outline of our sweet state and the secret piece behind her ear “216.” She just might be our best billboard for creativity and personal expression yet! Katie, is was very nice to have met you, I hope you had a great night out! It was summer in Cleveland at it’s best, for sure. More and more I’ve been noticing the love and passion that area Northeast Ohio lovers have dedicated to their skin. In Ohio “all things are possible,” from license plates all the way to tattoo art when it comes to making an outward statement for the love of our great state. I recently met this guy who not only had an Ohio outline on the inside of his right ankle, but on the outer side he had the famous 1979 title of Ian Hunter’s rock song “Cleveland Rocks.” The reason this guy had these two tattoos, were not only to show how much he loved Ohio, but he was actually named after the musician of this song and felt it very fitting. Thanks Ian for the making me stop and marvel at your ink, nice to have met you.